Civilizations have risen and fallen across Golarion for thousands of years, leaving legends and ruins in their wake. Though nations may vanish, they are never truly gone so long as their traditions and descendants still survive. 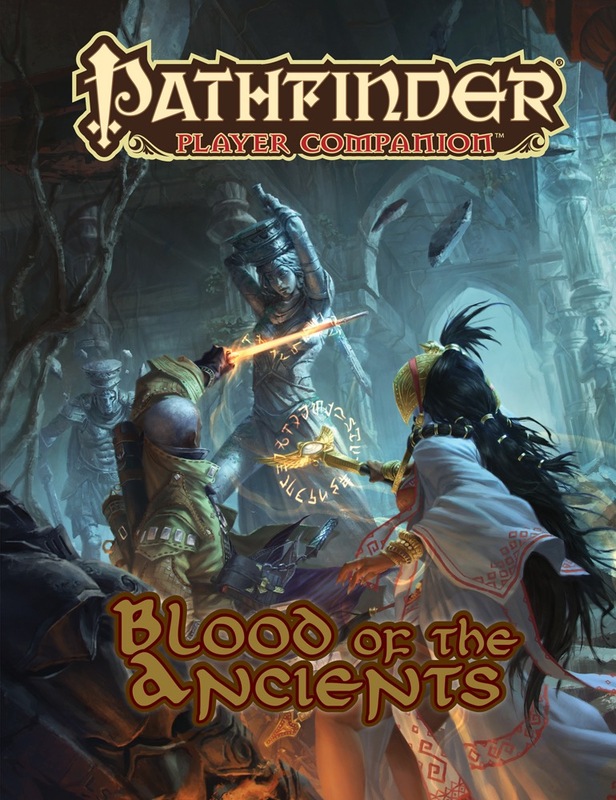 Breathe life into these lost cultures with character options that trace their origins back to ancient times, or pay homage to a distant ancestry with one of the archetypes presented in Pathfinder Player Companion: Blood of the Ancients! I would be surprised if they didn't include Azlant. You'd think so. Particularly since that's right when the pawns come out for RoA, and when a lot of people will begin playing it. Only human. Other races, even core, really get no love in Pathfinder (ok... in most D&D settings actually). Rogar, I can confirm that this book will most certainly not contain only options for humans. The product description text mentions "heroes whose connection to such civilizations manifest in surprising ways" -- an indication that we fully intend to include lots of useful class options and other offerings for nonhuman characters as well as humans. Does that include non-core races? We going to get more info on Old-Mage Jatembe? Because he's probably my favorite part of the Golarion setting. Will this be just "Blood of the Ancients of the Inner Sea+Azlant" or will there be stuff from the great world? Hopefully there will be stuff various parts of Golarion and not mostly the Inner sea. I wonder whether we will have anything for Gillmen and other races that are basically humans mutated from ancient origins? Everyone of them has been relevant for most races in Golarion, including some for the more exotic--Blood of Beasts was really good. I like this! Too bad it's all the way into next May. Will be excited when it gets closer, I am certain. We don't see much about the Jistka Imperium, that'll be interesting! Maybe I didn't explain myself very well. What I meant is the book is going to explore options coming from ancient human empires. The fact that mechanically other races' PCs will be able to access feats, spells and whatnot has nothing to do with it. According to Golarion's lore demi-human races also had "ancient fallen empires". The dwarves had Tar Taargadth, the elves had pre earthfall Kyonin (at least) just to name 2. These are legacies that matter for their players (and GMs, since exploring ancient Dwarven/Elven ruins is quite the fantasy trope), probably more than most human empires but Azlant do for human characters. TL;DR: The problem is not the options will be mechanically open for everyone even if according to lore 9 times out of 10 it will make little sense for a Nagaji to get powers related to Azlant or the Jistka Imperium ("just rename the feat" is a thing, right?). The problem is you choose "Ancient Empires" as theme for this book and then only included human ones. The problem is you choose "Ancient Empires" as theme for this book and then only included human ones. Not really surprising, given how humano-centric Golarion is. Also nothing in that solicitation text says it will only be human empires. That isn't even the final description, so maybe hold the end of the world talk until the final description is posted, or if your intent is to try to make sure they include love for non-human empires make a suggestion rather than a dismissive post... Just my opinion. I am sure they will mention at least one ancient civilization for elves and dwarves though as for gnomes and halflings that I am not so sure of. I'd be surprised if they DIDN'T at least include something for the ancient dwarf and elf civilizations. Nothing in that description indicates to me that it's only human ones. I'd love to see stuff beyond the Inner Sea region as well (ancient Tian Xia, anyone?) but no idea how likely that is. I would love some ancient civilizations run by halflings and gnomes. I wonder if we will get anything serpentfolk related. I'm most intrigued by the Jistka parts, but hope/wish there would be some references to ancient lizardfolk, troglodyte and serpentfolk civilizations. Cyclopses would be welcome too. Also, being a "Blood" book, I would be really surprised if there wasn't someone focus on non-humans. Like, maybe there will be stuff for the Caligni, Shabti, and the Samsarans. Crossing my fingers for something on Ninshabur and Taumata, but I would be terribly, terribly disappointed if there isn't more information about long lost Valashai! It's about time we had more than the vaguest hints about that ancient empire. They are certainly some of the least fleshed out of the playable races. So what ancient civilizations do you want get some love in this one? Ghol-gan, Jistka Imperium, Tekritanan League, Ancient Osirion and the Shory would be my top five choices. Ancient dwarven and elven lands would also be cool to see, but I feel like they don't change quite as vibrantly as shorter-lived human civilizations, being longer-lived (particularly in the case of elves) and / or bound by tradition (for dwarves). I feel like we've gotten *plenty* of information on Thassilon, at this point, and expect we'll get more when the rest of the Runelords rise, over the next couple years (speculating wildly). More of Osirian deitys please. Non-human ancient civilizations would be cool like serpentfolk, elves, dwarves, cyclopes, those reptilian giants that ruled the Valashmai jungle, etc. I first noticed this while reading the Construct Builder's Handbook thread, specifically when it was discussing a possible construct-focused Player Companion. Now I really want some of these Ancients to be constructs still running a few millennia later. Demon with a Glass Hand anyone? Maybe we'll find out who were the seven original ones? 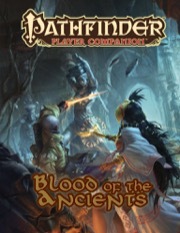 I like (most) of the "blood of" type books so I am looking forward to this one as well. Now if we could just get blood of dragons, blood of fey, blood of giants, blood of the mythos, blood of magical/mythical beast, blood of chaos/maelstrom, and blood of law/axis based books. Still better if split up in several different books, handling different regions/possibilities there! I would also like "blood of books" for constructs and undead but I don't think "blood of" really fits such creatures. Congealed Fluids of the Undead?